After blogging for six months I tried an experiment. The next post is not part of my series on the English language. Rather it is an environmentally friendly post. The subsequent post was not part of my series either. It was a bit of fun with words and the precursor to my first attempt at Blogging from A toZ in April. Back in January 2013 I had not heard of the A to Z challenge. I publish new material here on Mondays and link to two archive posts on Thursdays. Comments are closed on earlier posts, but you are welcome to comment on them here for a short time. Today I have been blogging for six months. I know that isn’t very long in the grand scheme of things, but I’d like to mark the occasion by inviting you to join me in sharing your hints and tips for saving energy and resources. If you are able to write a post about your own favourite ways of doing this, please link on the community pool, where I have floated the idea – I do like puns! Please use the category or tag Green lifestyle and tag blog carnival. I’ll link back to all your posts. 3) that leaving a paper shredder connected to the mains and switched to “auto” uses electricity. When I am cooking on the hob, after the potatoes have come up to the boil, I usually transfer the pan to a smaller gas ring. (Less energy is required to keep water boiling than to raise its temperature.) Also I try to avoid boiling more water than I need to. After a bottle of soap or detergent has too little liquid left to extract it using the pump or squeezing the bottle, there is still a useful amount which can be used by diluting it. When travelling by motor vehicle, plan journeys so that fuel is not wasted by too many comings and goings. In one visit to the nearest town, it should be possible to have a haircut and do some shopping, for instance. Using public transport also saves fuel used as services run to a timetable. In rural areas the services may be reduced if they are not used by enough people. Many materials can be recycled, depending on the local arrangements. Paper, cardboard, glass, drinks and food cans and some sorts of plastic, as well as many unwanted household items may be taken to recycling centres or even collected from your street. I always remove the paper from food cans and recycle them separately. Another tip is that you consider whether you could use the material you are about to send for recycling. Recycling uses fuel. If you use the blank part of the paper you were about to recycle to make a shopping list, perhaps, you are not using new paper. One of the constituents of paper is wood and trees are cut down to provide it. Sustainable sources of paper are those where trees are planted to replace those felled. Recycled paper products tend to be fairly expensive, but their use is to be encouraged. 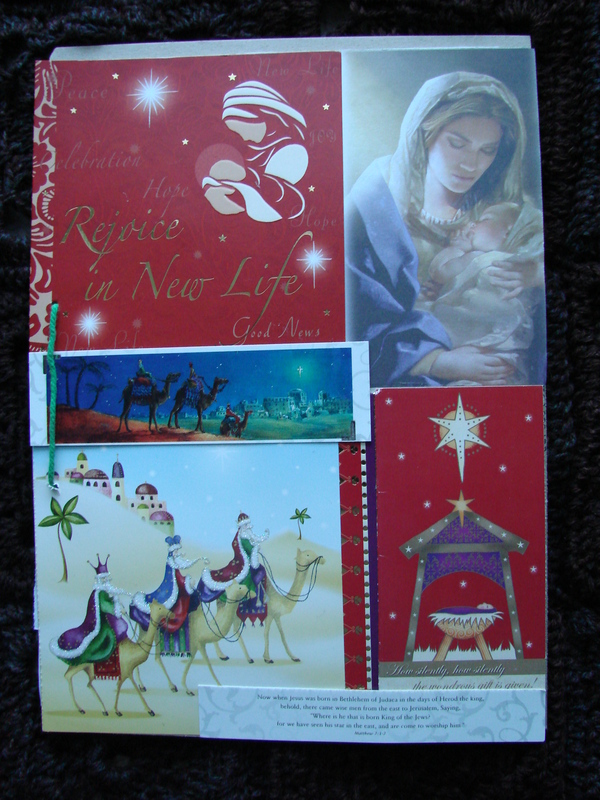 Here is a photograph of a folder I have made using cardboard, old Christmas cards and an India tag. I could have used string or ribbon, but I happened to have a tag. Unwanted cardboard can be useful in making items which might be bought and are probably made of plastic. Oil reserves are not unlimited and we should be careful how much plastic we use. Some plastics are not readily biodegradable and cause environmental problems. Some charities either collect or accept unwanted goods, which they sell or pass on to people who need them. Choose products with the least packaging. Use refills. If you are able to make your own compost, you can use it to grow food. I haven’t even started on conserving water, but I think that’s enough to be going on with!